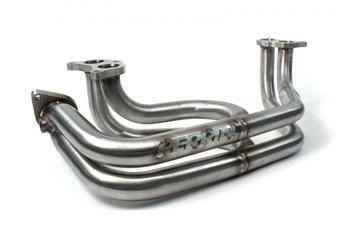 Perrin Header Systems SUBARU - Dezod Motorsports Inc - Home of the automotive performance enthusiast since 2002. Reaching back to lessons learned by tuners in our past, PERRIN has grabbed a dramatic power increase that was previously bottled up by the factory manifolds. The equal length design of the PERRIN header, produces smoother more balanced exhaust pulses flow from the head to the turbocharger giving you the best of two worlds. Quicker turbo response as well as more horsepower and torque throughout the entire RPM band. While designed to fit to the factory up-pipe, our header will mate with any aftermarket up-pipe that works with the OEM header. You wont see grossly, way over sized tubing to make our header LOOK better. That just slows down exhaust gases and loses response. The PERRIN Big Tube header uses 1.625” primary tubing that fits the Subaru exhaust port size. Our larger diameter header was designed for cars making 500+ wheel HP to not sacrifice low end power on cars with big aftermarket turbos installed. For those looking for more HP from their stock turbo to slightly upgraded turbo, we suggest to look at our Regular WRX/STI equal length header. PERRIN Flanges are CNC machined from 304 stainless steel and counterbored on the back side to make smoother transitions. Flange ports sized properly to ensure exhaust coming out of the head has a smooth unobstructed path to the tubes. The ports are not over ported which causes gaskets to burn out quickly. Because of it equal length design, the PERRIN header will alter the tone of your exhaust. The exhaust pulses from the engine are equalized and spread out producing a smoother, more refined sound. Some describe the sound to be EVO like similar to an inline four cylinder engine exhaust. Most headers collect on the passenger side of the engine, and due to space constraints, are not equal length, compromising exhaust flow. Because we use the added room provided by the oil pan (only on 2.5L turbo pans), we can create a smooth transition of the header primaries to the collectors, and collectors to up-pipe, providing more power and torque than the competition.